Losing a loved one can be devastating. To help you with the emotional pain that naturally occurs from an event such as this one, seek the services of a Christian grief counselor. Grieving for your loved one is a difficult process and the appropriate counseling will help you find comfort and understanding. 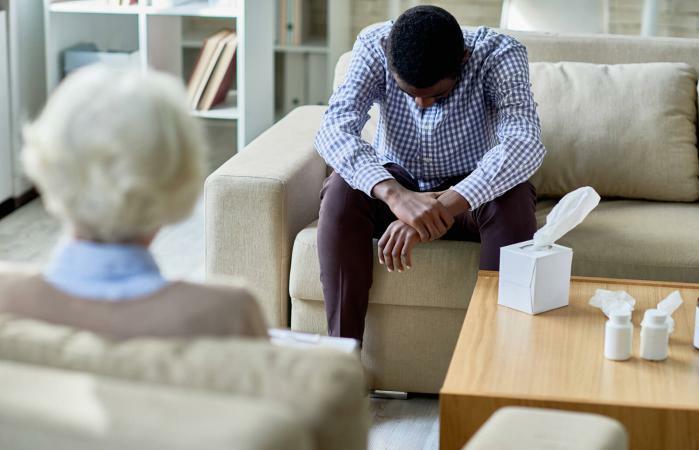 Christian and non-Christian based grief counseling can help people deal with the emotional pain of a loved one's death, but they are different in what they focus on during counseling sessions. Christian grief counseling is the integration of faith along with support and guidance to move you through the grief process. God's word is important to many people, and can greatly help them come to terms with death. With secular counseling, spirituality and God are not a central theme in counseling. While many counselors are comfortable discussing God, even in secular grief counseling, the sessions are not dedicated to the exploration of how spirituality helps in the mourning process. As you mourn your loved one's death, a Christian counselor will help you understand that your loved one is in heaven, without pain and suffering. The goal of the counselor is to help guide you through the grieving process and to help you understand that your loved one is in the loving arms of the Heavenly Father. This enlightenment serves to bring you peace and acceptance. Communication is one of the best ways to cope with the loss of a loved one. You may want to speak with someone who is close to you. You may want to speak to God through prayer. You may want to write down how you feel. 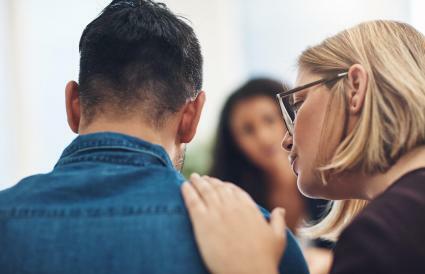 Expressing your feelings through some form of communication about the loss you have suffered and the grief that you feel can eventually help you find comfort. Once you find comfort and acceptance, the grief counselor will work with you to help you move on with your Christian life. This will enable you to someday join your loved one in heaven. You will learn about God's plan for you now that your loved one is gone. Along with your counselor, you will devise a plan on how to make the most of your life. This may include spreading the word of God, helping others who are in need or doing charitable work. Therapy will end when you feel that you can stand on your own two feet without the support and guidance of the counselor. You'll feel at peace with your loved one's death and empowered to proceed with your life in the glory of God. This happens through your faith. You trust in God and trust that He is true to His word. God makes incredible promises to His children. God is sovereign which means God is in control. He has a purpose for everything that happens, therefore there is a purpose for your grieving and suffering. When you are grieving, you can always access God through prayer. You can tell God you're hurting and you're suffering. You can pray to Him about your fears and emotions. You can ask questions as well. You don't want to grieve alone or isolate yourself. Grief has a way of bringing people closer together. They will grieve with you, pray with you and pray for you. There isn't anything that can be done when you lose a loved one. Nothing can bring them back. Remembering the good times is most important. The most healthy way to deal with the loss of a loved one is by accepting the death and the grief that goes along with it. That pain from the grief will eventually move through you so you are able to move on. Most pastors have at least a master's degree in some human services field such as psychology or counseling. While a degree in counseling isn't absolutely necessary, it is important to some people. When seeking grief counseling from a pastor, you will be able to discuss your thoughts and feelings while asking specific questions about the meaning of life and death. A pastor is able to give you detailed explanations because he is highly educated on the teachings of God and the Bible. Most pastors reserve time outside of church hours for counseling. Call your church and ask about these times. If you are in crisis, most pastors will meet with you as soon as possible. You can also ask your pastor about other resources for faith-based grief counseling. Search the Internet or yellow pages for counseling centers in your area. You may be able to find Christian counseling centers or have to call around in search of a center that provides faith-based counseling. By using a counselor from an agency, you'll receive someone who has specialized training in grief counseling. The only downside is that the counselor may not have as many answers to your specific questions unless he/she has extensively researched the faith. Of course, many counselors who don't know the answer to clients' questions will reach out to a pastor or other religious resources to find the information you need to help with your therapy. Many sites have grief counselors waiting to chat with you online or on the phone. If you feel more comfortable talking about your loved one's death in the privacy of your home, this may be perfect for you. Usually, credible websites will have specific information about the counselor's degrees and certifications, and with faith-based counseling, the site should include information about the counselor's beliefs so you can make a determination if the counselor is best suited for your therapy. If your loved one was in hospice, the hospice center usually provides free counseling. Whether it's Christian-based depends on the type of hospice your loved one was in. Books having to do with Christian-based grief counseling can help you understand the process and give you hope for peace. Christian Counseling: A Comprehensive Guide explains how counselors perform Christian counseling for many issues. You'll learn not only how they approach grief, but the ways they help people heal from many life stressors. The Complete Guide to Crisis and Trauma Counseling is used by Pastors and other Christian counselors wanting to find new ways to help people dealing with crises. It's Biblical in nature, which makes it the perfect depiction of how a Christian-based counselor would run a counseling session. Helping Those in Grief: A Guide to Help You Care for Others is another book that many counselors use to help them bring in God's word to their grief counseling sessions. It identifies passages from the Bible that can help mourners understand life, death, and moving on after a loved one has died. With faith-based counseling, many times people become discouraged because they don't receive the help they need right away. The feelings you are dealing with are deep and it may take some time to bring them to the surface so you can finally feel the power of faith in helping you overcome this devastation. Understand that it's normal to feel angry, even at God, but with time, your anger will subside and you will soon find peace in this inevitable life event and move on with life with a new perspective and stronger faith.